Spianada is the central square of the island. It is the largest square in the Balkans and one of the largest squares in Europe. In front of Kato Plateia the imposing Liston is found. Designed by the French mechanic Mathieu de Lesseps, its construction began in 1807 and it is on the western side of Spianada. One of the prevailing theories about the name “Liston” is that it comes from the word “Lista” (list) which included the names of all the noble ones, the Libro d’oro, who were allowed to enter that particular area. 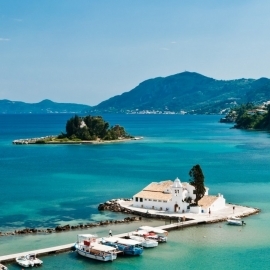 It is the most famous pedestrian street of Corfu, the meeting point for locals and visitors. The imposing mansions that form big arches compose the characteristic image of Liston that today hosts a plethora of cafes and restaurants. 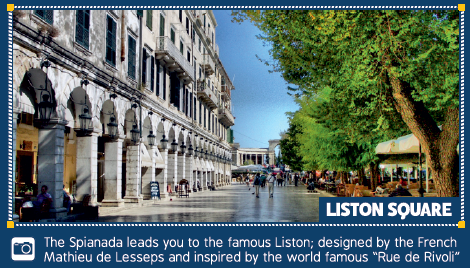 The pedestrian area of Liston is the most cosmopolitan spot of the city, which is usually crowded, because many philharmonic orchestras and litanies of St. Spyridon pass through that street.